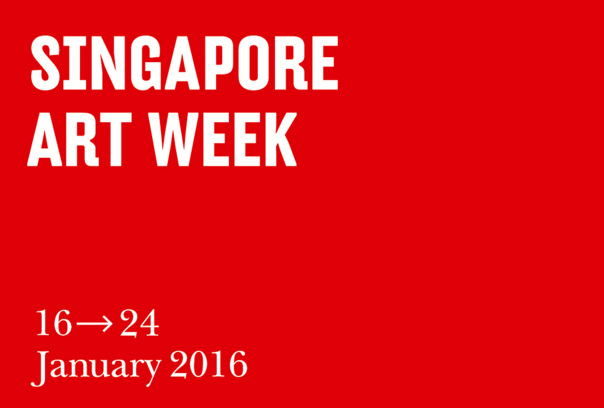 The fourth edition of the annual Singapore Art Week returns 16 to 24 January 2016. You can expect nearly 100 visual art programmes over nine days. Art is brought closer to the community and enlivens Singapore’s urban spaces. There will be visual arts presentations in unexpected spaces such as re-purposed shipping containers and site- specific installations in distinctive neighbourhoods that will engage a wide range of audiences. Singapore Art Week 2016 allows both established and emerging home-grown talent to be presented alongside their regional and international counterparts, across commercial and not-for-profit platforms. This year, more arts groups including emerging artists and new art collectives are taking part in the Singapore Art week. Venues are located around the Civic District, Marina Bay, Bras Basah and Bugis areas as well as precincts at Gillman Barracks, Chinatown, Kampong Glam, Little India and Joo Chiat. Three art fairs are happening during Singapore Art Week 2016 – Art Stage Singapore, Singapore Contemporary Art Show and Art Apart Fair. Over 250 galleries from here, the region and worldwide come together to exhibit contemporary art. Visit ‘A Public Living Room’ at the sixth floor of People’s Park Complex in Chinatown or a multi-disciplinary art festival covering art, performance and film at ARTWALK Little India. A new installation by art collective Vertical Submarine called ‘Death by a Thousand Cuts’ is at Shophouse 5 located in Geylang. Enjoy an immersive theatre experience in Joo Chiat by OH! Open House called ‘No Man’s Land’. ENVISION: Sculptures @ the Garden City features 13 sets of sculptures by 11 renowned artists from Singapore and around the region. A Public Art walking tour of the first three commissions under the Public Art trust is available around the Civic District. Exhibition on Screen at the Projector will screen documentaries that go behind the scenes of exhibitions by master artists. State of Motion exhibition and tour lets you discover the golden era of the Cathay-Keris Studio, the filming locations of five classic films, and art works created in response to those sites. Spirits of Cinema is a screening of short films by Singapore film collective 13 Little Pictures. CONCRETE ISLAND bus tour by academic and architect Dr Lai Chee Kien lets you explore Singapore’s urban history. Discover the dynamic installations and eye catching murals along the North East MRT line in Art in Transit. There is also Heritage Tours of the NUS Baba House and ART IN Motion that brings visitors through 17 leading galleries. The world acclaimed Steve McCurry is exhibiting his works while Jane Lee will exhibit her works produced during her STPI residency. Singapore Artist Tang Da Wu’s seminal Earth Work 1979 will be exhibited at the newly opened National Gallery Singapore. Check out over 100 artworks by graffiti artists from all over the world at the Singapore Pinacothèque de Paris. Andy Warhol, Social Circus features a rare collection of Andy Warhol’s polaroids featuring prominent actors, artists and fashion designers from the 70s and 80s. 25 promising artist’s artworks curated by Joanna Lee and Patricia Chen in SCOUT SINGAPORE: Emerging Art Practices. The pop up exhibition in 16 converted shipping containers arranged in a spiral shape at Gillman Barracks. Visit artweek.sg for the schedule of events.